WATCH: Why would anyone want to hurt Max? A KEPNOCK dog owner is pleading with the community to be more vigilant about dog baiting after her pet chewed a piece of poisoned bacon wrapped in fishing lines. Leila Thompson owns two dogs - an american staffy, Max, and a maltese cross shih tzu, Mr Fuzz. 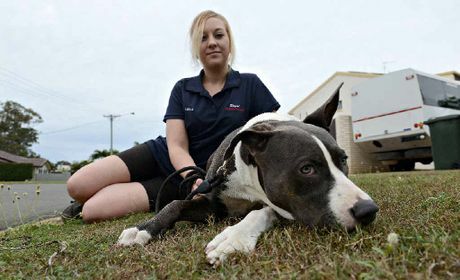 When she awoke early Tuesday morning to see her partner off to work, her staffy bounded into the backyard and quickly began chewing on something. 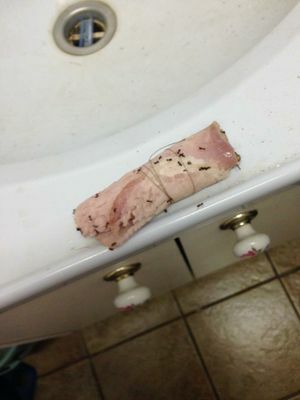 The bait Leila Thompson found in her dog's mouth. "We knew it was bait because the ants that were on the bacon were dying from the poison." Crying and in shock, Ms Thompson and her partner took Max to the Bundaberg South Vet Clinic. "It's happened before and it's really devastating to see our dog suffer," she said. Veterinarian Clarence Bere said the quick-thinking action of the couple probably saved Max's life. "The owners were right on to it and made their dog throw up to get the poison out," he said. Dr Bere recommended owners try to remove bait from their dogs but only if it were safe to do so. He said owners should wear gloves and bring their pet to a vet immediately. Ms Thompson knows only too well the pain of losing her pets to dog baiting. When her family moved to their Kepnock address in 2012 her neighbour warned her that dog baiting was prevalent in the area. "We had no problems and then, six months after, our 10-year-old family labrador was poisoned," she said. "My mum was carrying her out to the car and as she did the dog died in her arms." It wouldn't be the last time. Two years ago, her brother awoke the family at night when their puppy was having a fit due to dog baiting. The puppy later died. Ms Thompson said even Mr Fuzz was a dog-baiting survivor from an incident a couple of years ago. "He kept having fits and we luckily got him to the vet and saved him," she said. "It cost us $3000 to save him." She had some simple words for the person responsible. "It is the most devastating thing that can happen," she said. "The dog suffers and the family suffers too." RSPCA Queensland spokesman Michael Beatty urged pet owners to report dog baiting incidents to police, RSPCA and the council.